Join us for two hours of bliss! The first hour you will be led through a yoga class by one of our certified yoga instructors while the goats meander around (and sometimes ON) you all the while perfecting your yoga technique. The second hour you are welcome to stay and spend time with the goats, giving them all the love they deserve. The goats love showing off their yoga moves and you will love spending time with them. You don't want to miss this absolutely amazing experience! Classes start at 11:00am at The Wobbly Ranch in picturesque Snohomish, WA. Upon arrival you will be greeted by your welcoming hosts, 5 very silly yoga goats, a serene pasture, and if we are lucky, sunshine! The first hour you will be guided through yoga practice by one of our certified yoga instructors. This is an all levels class from beginner to expert. 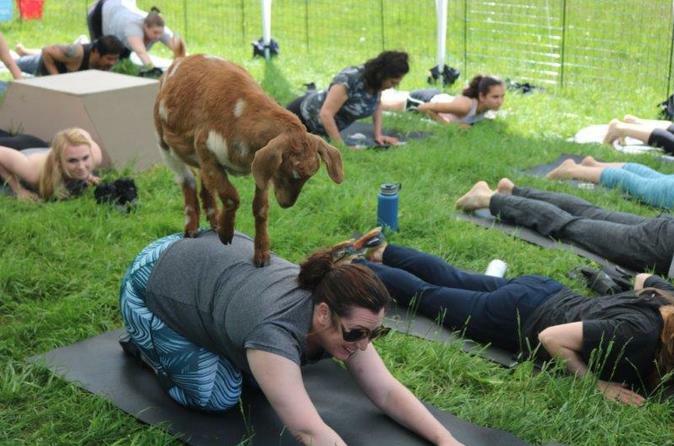 The goats will wander around while you are doing yoga and often use you as a jungle gym. After class you are welcome to snuggle baby goats, have your picture taken, and meet our larger goats who do not participate in yoga. We provide yoga mats for you to use while you are here.